Another 80s classic hits the iPhone in stunning fashion. Apple's iPhone is the device to own for 80s nostalgia. We've already seen a faithful rendition of the Don Bluth arcade classic, Space Ace, and Dragon's Lair recently arrived in the App Store as well, courtesy of Electronic Arts. Somewhere in the middle, however, is Cobra Command, an old 1984 Data East arcade game featuring the same laserdisc technology as those two games. Revolutionary Concepts brought it back from its grave for portable play, and it's done a bang-up job. Like Space Ace and Dragon's Lair, Cobra Command leans heavily on trial-and-error. There are ten stages of constant action, with helicopters, tanks and other enemies ready to blast your chopper from the sky. You've got to shoot them first, using a virtual touch-screen tool and firing mechanism. Succeed, and the sequence moves on. Fail, and your chopper goes down in flames. Because of the limitations in gameplay (you're essentially playing an interactive cartoon), Cobra Command doesn't have much replay value. However, it's a total romp playing through the missions, shooting enemies as you fly through caverns and around the Statue of Liberty. 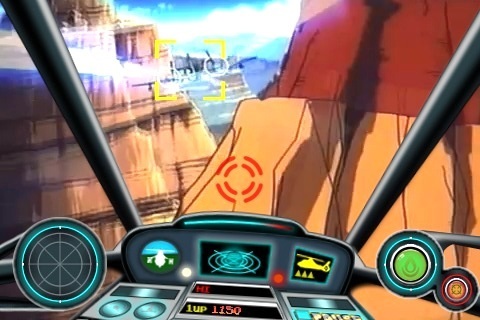 The gameplay runs very smoothly, with no problems targeting and blasting bad guys. There is one bonus feature worth mentioning, the inclusion of leaderboards. That's right, you can post your highest score in each round to an online board and see how you compare against other players. There are some repeat scores in the higher ranks (there's only so many points to get during a round), but it's great to join the elite. 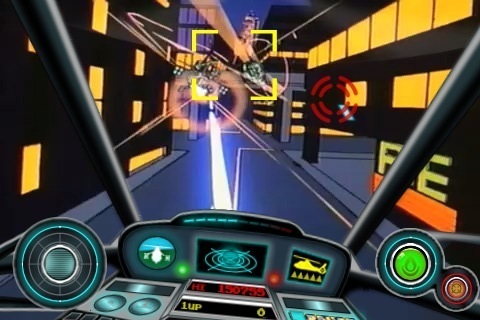 As for the graphics, the video runs crisply on the iPhone, with smooth running action sequences and an easy-to-use touch interface. Even the destruction of your own helicopter is fun to watch, lighting up the screen in bright orange and yellow flames. The sound is equally impressive, with a rockin' soundtrack and plenty of booms. Grab your headphones for this one. If you picked up Space Ace and already have Dragon's Lair, you'll want to make room for Cobra Command. It works in a very similar manner, and is a ton of fun. It isn't as interactive as Ace Combat XI, but you'll enjoy the twitch shooting and impressive visuals. Besides, where else can you blast enemies off the Statue of Liberty's shoulders without getting crap from Homeland Security? Boy, do we miss the 80s. What's Hot: Sharply restored visuals and audio, classic quick-twitch shooting, global leaderboards will leave you gunning for a high score. What's Not: Limited replay value for those who didn't appreciate the original arcade game.